Here you see an real estate Joomla! template, which can become an interesting uncommon solution for your company. 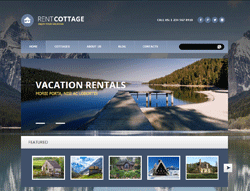 Cottage rent Joomla template incorporating the latest trends of web design. The template meets with high-resolution photos. These professional illustrations have their own outdoor romance and would definitely get visitors interested in your website. The content area (also encrusted with nice pics) would make the visitors feel comfortable dealing with your website. With the responsive layouts your customers would be able to contact your site from their mobile and tablet devices. 002091 Responsive Joomla! template is based on the Bootstrap Framework. The Bootstrap Framework makes it fully responsive to all screen resolutions and aspect ratios. Moreover, thus it carries a lot of useful features, for instance additional HTML elements, set of CSS components, grid system and much more.